Sacred dance is any type of dance that is done with an intention to connect with or communicate something about the sacred, however that may be understood by the dancer or the choreographer. Sacred dance has a rich history which stretches back to the earliest periods of human society, when ritual movement was part of our efforts to understand and control the natural world. This effort was a part of daily life, and, as such, evidence of sacred dance can be found in almost every ancient civilization. As societies developed politically and culturally, so did dance and its sacred uses, resulting in the traditional and contemporary forms of movement that are familiar today. A personal practice, done alone or in a group, to facilitate spiritual and personal growth. It can be all these things and more. What defines sacred dance is not its outward elements, but its inward intention. Dance is an outward practice that helps us travel inward. The following list offers some of the broadly defined types of sacred dance, which often overlap and interact with each other. None are mutually exclusive, and there are many variations within each. Liturgical dance is sacred dance done in the context of a religious service of worship. It is sometimes also know as worship dance or praise dance. A liturgical dance group is sometimes called a movement choir. Liturgical dance exists in many faiths, including Christianity, Judaism and Hinduism. Liturgical dance, whether traditional (such as Hindu temple dance) or contemporary, enhances religious stories, meanings and symbols with gestures and movement. Many cultures around the world have developed their own dances, and these often have a sacred element to them. This is true of African dance, Hawaiian hula, Persian dance, and many others. Frequently, these dances contain storytelling elements and gestures that connect the dancers and their audience to the natural world and to their community. Conscious dance is movement that is done for the purpose of self expression, meditation, and connection. When this type of dance is freeform or unstructured, it might be called ecstatic dance or trance dance, and it would also include contact improv and some creative dance practices, such as authentic movement. Conscious dance can also include structured movements such as circles dances or body prayers. 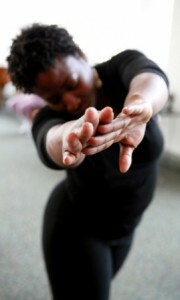 There is often an emphasis on healing, and personal or spiritual growth in conscious dance. The founders of modern dance, such as Isadora Duncan, Ruth St. Denis, Ted Shawn and Martha Graham, frequently used sacred themes in their art. Building on this tradition, many professional dancers and choreographers continue to explore sacred concepts today. Often fusing styles and genres, and experimenting with space and presentation, a new generation of dancers are exploring the sacred in contemporary ways.